On Goodreads, the book is linked to Goodreads Author Wes Moore who wrote and self-published? books The Maker and Forcefully Advancing — both with 4-and-above star ratings (with 5 and 2 ratings each.) Upon close examination, the actual author Wes Moore of This Way Home is not tagged as a Goodreads Author and on his author page This Wawy Home is not listed along with his three other titles. This could be the reason why the book was attributed to the wrong author. Goodreads seems to rely on Goodreads Authors’ to actively remove books not written by them from their books list. I sent a message to the Goodreads Author Wes Moore and will report back if he takes action to correct this mistake. Goodreads or Amazon system administrators probably would NOT easily have caught or fixed these mistakes. The big consumer sites system designers sure will not make it a priority to report this kind of “small” mistakes. Even if it were easy to report, I wonder what they can actually do about it — manually remove “bought together” or “viewed together” data? Create a warning label that says, “Hey, there are more than one Wes Moore author up here, proceed with caution”? Probably not! Definitely read the book description carefully. This Way Home is about basketball, sinister street gang, courage to take a stand against the gang and that in the end, hope, love, and courage are our most powerful weapons. 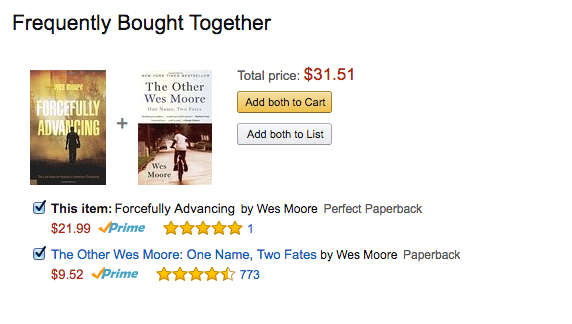 Examining the other titles by this Goodreads Author Wes Moore, I realized that there must have been some confusion. I also took note how the number of ratings/reviews given to each title and evaluate the true meaning of the STARS. Here on Amazon, Forcefully Advancing has a high-flying five-star rating (with 1 review) and The Other Wes Moore that is “Frequently Bought Together” has 4.5 stars (with 773 reviews). The bottom line – as a librarian for young consumers of both material goods and information, I shall focus more and more on how to educate my students to be clear-headed, detail-minded, and persistent when navigating the extremely tangled and confusing world of information. The Goodreads Librarian Discussion Group was really helpful — now This Way Home is attributed to the correct Wes Moore! It’s such a good point (and example) of how we need young people to learn digital literacy, too!